The interaction was a slightly tweaked version of similar interactions Gandhi had before launching the Congress' manifesto ahead of the 2014 national election. 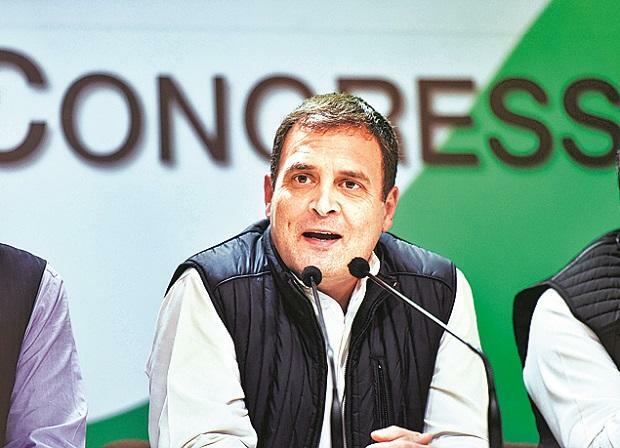 In what is seen by many as the Congress' answer to the Prime Minister's Mann Ki Baat, the party on Tuesday afternoon posted a short clip on social media that shows its president Rahul Gandhi, dressed casually in black, talking to a group of students in a Delhi restaurant. After introducing himself, the 48-year-old says, "Welcome to the first episode of 'Apni Baat Rahul Ke Saath'." Congress leaders later said it was an impromptu conversation — the students were told that a leader of the party would talk to them, but they were stunned when it turned out to be Rahul Gandhi. "I thought I will have a chat with some of the young people and get a sense of what they are thinking," said Gandhi. The interaction was a slightly tweaked version of similar interactions Gandhi had before launching the Congress' manifesto ahead of the 2014 national election. The battle of wits between Chhattisgarh journalists and the Bharatiya Janata Party (BJP) state unit over the alleged assault of a scribe by party workers last week continues. On Tuesday, local journalists protested in a unique manner. Many attended press briefings by the party wearing helmets meant for two-wheeler riders (pictured). One of them also said their new dress code was part of the Patrakar Suraksha Abhiyaan or save journalists campaign. “We will lift the visors when we have to ask a question and lower them back after having spoken," he added. Yoga guru turned businessman Ramdev's close aide and co-founder of Patanjali Ayurved, Acharya Balkrishna, was awarded a D.Litt degree by Awadhesh Pratap Singh University in Rewa, Madhya Pradesh, recently. Before reaching Rewa Balkrishna had a brief stay at a VIP guest house in the state capital Bhopal. Observers pointed out how this particular visit was different from his earlier visits to the state capital. Earlier, when Ramdev or Balkrishna visited the state, they would be surrounded by political leaders, ministers and bureaucrats all the time. They would be hounded by journalists who would later complain how Balkrishna didn't offer "media sound bites". This time around, a junior government official was the only visitor he had to contend with at the guest house.